Ben is kind, talkative and passionate about growing food. 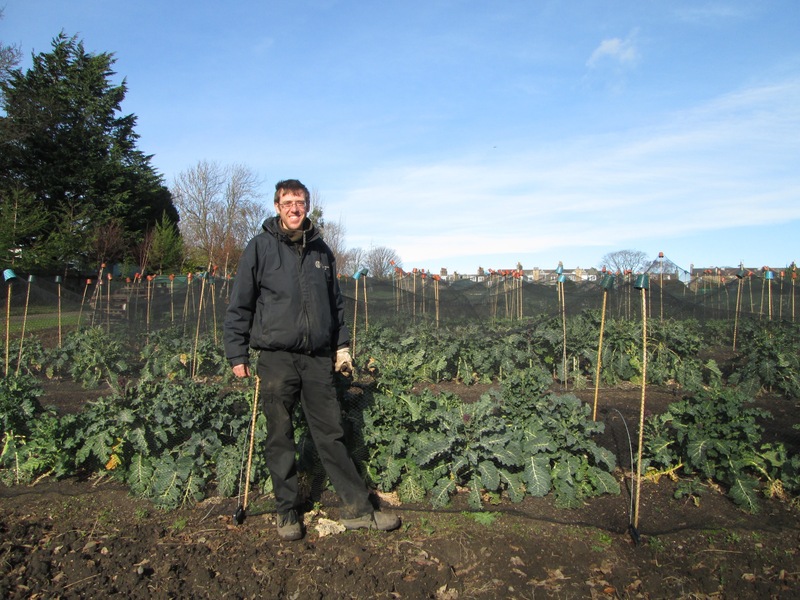 He says he has been interested in knowing how to grow his own food since his teens, and that interest led him to becoming a Community Gardener of the Botanics. Ben in the Market Garden where produce for the Garden’s catering outlets is grown. Ben’s job is not only to look after the land. He maintains the Market Garden area that provides some of the vegetables at the catering outlets within the Garden. But he also shares his knowledge with different groups to teach and inspire them to grow their own food. For him, this garden makes a lot of sense, fitting perfectly into a local food supply chain. The Garden has the space, resources, knowledge and demand (via the catering offer) to grow food. Ben thinks there are lots of opportunities for more local food production to take off. In our conversation, he recounted history: after World War II rationing still restricted consumption of many food groups. So during the “Dig for Victory” campaign, the government incentivised people to grow their own food, and in this way they were independent and sustainable. However, Ben acknowledges that currently, many people do not have the time to grow their own food. Remarking that some don’t even feel they have time to cook it! And for him, this is a barrier to accessing nutritious food far more powerful than money, because he knows that you can buy good food without spending too much. For our Community Gardener, a nutritious diet can be achieved if each person can take responsibility for what they eat: recognize where their food comes from and take pleasure in the task of cooking it. And, of course, share that homemade food with family and friends, not only to nourish the body, but also the heart.